Learn skills. Get certified. Advance your career. Align teams. Improve skills and processes. Deliver better products. 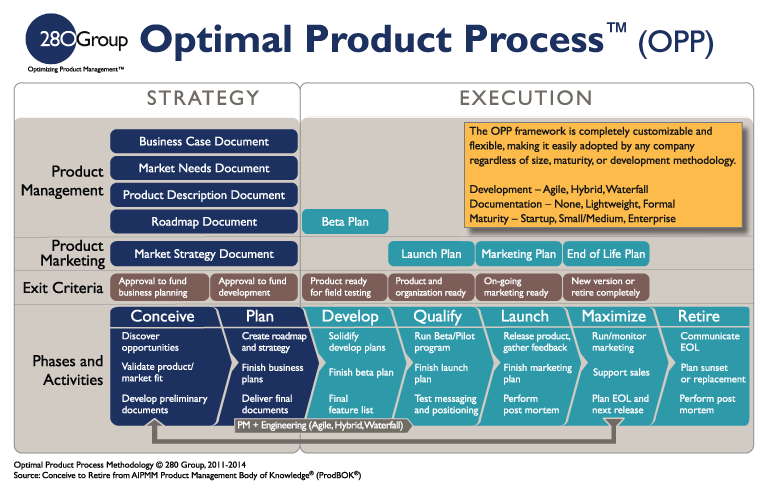 Our Optimal Product Process was created by our team of consultants and trainers with over 150 years of combined Product Management and Product Marketing experience. It covers everything that a company or team needs to create products that delight customers and maximize revenues. "280 Group made a huge impact on our Product Management and Product Marketing efforts… we were very impressed by the quality, professionalism and timeliness of their work." John ButlerSenior Vice President, Tadpole Computer, Inc.
"280 Group delivers excellent business and technical skills… I would highly recommend them for other consulting projects that involve strategic planning and/or Product Marketing and Product Management." This best-selling Product Management book gives you the tools to vastly increase your skill level and become a great Product Manager.